Have Common Core State Standards changed what U.S. teachers think and do? RAND Corporation researchers use data from surveys of the American Teacher Panel in 2015, 2016, and 2017 to examine change in use of instructional materials and knowledge of state standards and standards-aligned practices among mathematics and English language arts (ELA) teachers. Findings indicate that teachers' use of standards-aligned and content-focused online materials appeared to rise even though their use of published textbooks change little. Although most aspects of mathematics and ELA teachers' knowledge about their standards did not change, ELA teachers were less likely to regard the use of complex, grade-level texts as aligned with their standards in 2017 than in 2016. While researchers observed no changes in mathematics teachers' practices overall, mathematics teachers of low-vulnerability students reported that their students engaged less in some standards-aligned student practices in 2017 than in 2016; similar changes were not observed in reports of teachers serving more vulnerable students. ELA teachers reported that their students engaged less in several standards-aligned practices in 2017 than in 2016. More research is needed to consider whether teachers' instruction is changing over time and, potentially, in response to Common Core State Standards. Given the great variation in Common Core implementation across states, research in individual states may be more informative to pinpoint changes to teachers' instruction and the state policies that may be supporting those changes. Nevertheless, the findings imply that states and districts must do more work — and possibly more through online venues — to support and build teachers' knowledge about their standards and standards-aligned practices. While teachers' use of published textbooks changed very little, their use of standards-aligned and content-focused online materials appeared to rise. ELA teachers were less likely to regard the use of complex, grade-level texts as aligned with their standards in 2017 than in 2016, although most aspects of teachers' knowledge about their standards did not change. Mathematics teachers of low-vulnerability students reported that their students engaged less in some standards-aligned student practices in 2017 than in 2016, whereas the authors did not observe any changes in reports of teachers serving more vulnerable students; mathematics teachers' overall reports of practice did not appear to change. ELA teachers reported that their students engaged less in several standards-aligned practices in 2017 than in 2016. Continue to innovate and provide standards-aligned materials for teachers online. Ensure that high-quality, standards-aligned content is available to teachers serving more vulnerable students. Provide more support for teachers to engage students with grade-level texts and support reading approaches that are aligned with their standards. Support teachers to engage students in text-focused practices. The research described in this report was sponsored by the Leona M. and Harry B. Helmsley Charitable Trust and conducted by RAND Education. 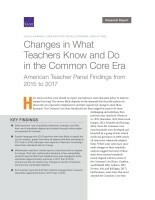 Kaufman, Julia H., V. Darleen Opfer, Michelle Bongard, and Joseph D. Pane, Changes in What Teachers Know and Do in the Common Core Era: American Teacher Panel Findings from 2015 to 2017. Santa Monica, CA: RAND Corporation, 2018. https://www.rand.org/pubs/research_reports/RR2658.html.